The Sevens. There are two of them here. Perhaps this should be two volumes but the title works so one volume it is. It is 2 and a quarter hours long, though. The first is the Group of Seven. While the first three studio albums (Whale Music OST excluded here), solidified the band's status as harbourers of the Canadian experience, it was The Music Inspired by The Group Of Seven which put the nail in the beaver dam. 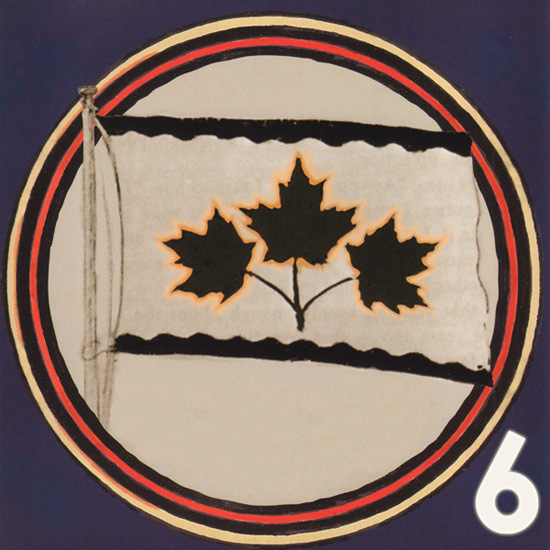 In 1995 the band was commissioned by The National Gallery in Ottawa to create music to accompany the Group Of Seven exhibit celebrating the 75th anniversary of the GO7. The band, in their own unique way managed to fashion an album seeped in Maple Syrup, from the clanging Railway sounds of Weiners and Beans to the cool cello of the revamped Northern Wish. This was the first album to feature Don Kerr on Drums, replacing Dave Clark earlier that year. It really is an amazing musical suite. Due to the fantastic recordings of the National Gallery performance and Radiosonic in Session, I have used mainly selections from those shows. The exception is Yellow Days from Calling Out The Chords which is for Noah Campbell who also helped with critical evaluation of this volume. The second Seven refers to The Blue Hysteria which was the band's 7th album. It is an album which divides some fans. Some have criticized it for its production and sometimes for not being quite the album that Melville, Whale Music and Introducing Happiness were. Whatever your opinion, I defy 99% of any musician to come up with an album even close to The Blue Hysteria. Fat, Sweet Rich Beautiful Mine, All The Same Eyes, Bad Time To Be Poor, Feed Yourself, A Midwinter Night's Dream. Every one is better than any song I'll ever write. I remember talking with Gord Downie at one of the post Harmelodia Green Sprouts Music Week shows at Ted's Wrecking Yard on College Street in about 2001. He was blown away by that anyone could write a song like Four Little Songs. I gave him my band's CD. I doubt he listened to it. Also included in this edition are Secret Red Canoe from the Truck Songs compilation and a live version of Bread, Meat, Peas and Rice which was written around this time (according to Dave). They provide a nice transition from GO7 to The Blue Hysteria. There are some fantastic live versions of epics like Fat, SWBM, Four Little Songs, A Midwinter Nights Dream, and First Rock Show as well as some seldom played selections such as An Offer, The Idiot and Connecting Flights. I must say, on a personal note that when I think of Rheos live, the first song that comes into my head is Fat opening the show at The Horseshoe Tavern in Feb 2001 with Don on drums. Must have been something in the beer.